First, hello! to everyone who is popping over from little elephants, and thanks, Veronique! Yesterday was my college roommate's birthday. I made this teapot for her as a housewarming gift (for the house she and her husband bought a year and a half ago- I'm a little slow), but sent it for her birthday. She'd requested a bee teapot on one of her visits to Memphis several years ago when I first began making teapots. I think I made this in November, but the glazing never was right, then my kiln decided to take a 4-month break. Kiln is now working properly again, and a fixative added to my glaze solved most of the streaking/ too thin spots that I had issues with, so after I fired it for the third time last weekend, I loved it up for a little bit then packed it up to send to Hester on Monday. 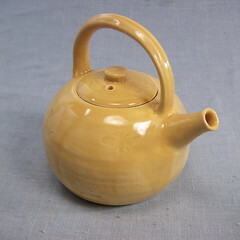 I love the bees peeking through the glaze, I love how the handle fits right above the spout. Sometimes I have problems with handle placement, but this guy may be my archetypal teapot. Even the lid fits perfectly. I made four honeypots that were fired in this load, but two of the lids broke (I dropped them on concrete) after firing. I hope I'll be able to make new ones, but the rate of shrinkage and the fact that I didn't note the dimensions of the wet pieces mean that making replacements might be difficult. I learn more about what I should be doing with my pottery every day, mostly through my mistakes. Oh, and here's another fun tidbit. The "not picardie" tumbler may be a gift to the universe. Yesterday I was at a birthday party at the playground at my son's school. The tumbler was in my car, so I used it for water instead of using a disposable cup. Four year-old parties always seem to end in meltdown, so the tumbler was left on the playground. Gary dear went to see if it was still there on his way home. It was not. One of the teachers rescued it, took it home, and said that she'd bring it to school tomorrow. If she doesn't, that's okay. I'm releasing it. Sortof like the cake plates, warped during their glaze firing, that we left on a bridge over a creek in our neighborhood. I was distraught about their Dali-like forms, so Gary decided to gift them to anyone who wanted them. They were in the creek the next morning. I wonder how long it will take for them to be worn down into pebbles. . . .